The newfound planet Proxima b is the closest planet outside our solar system ever discovered, and scientists think it might be amenable to life. But what would it be like to live on our nearest interstellar neighbour? The two facts researchers are surest of are that it circles its star every 11.2 days — to match the telltale stellar wobble they used to identify the orbiting planet — and that its minimum mass is 1.3 times that of the Earth. The rest is up to probability and future measurements, but the results look promising — especially because of its 4.2 light-year distance from Earth at Proxima Centauri, the closest neighbor star to the sun. “It’s not only the closest terrestrial planet found, it’s probably the closest planet outside our solar system that will ever be found because there’s no star closer to our solar system than this one,” Ansgar Reiners, an astrophysicist at Gottingen Institute for Astrophysics and co-author on the paper, said at a news briefing. Its closeness to Earth makes it not only a possible destination for humankind, but a perfect target to gather more information from home. Its star, Proxima Centauri, is much fainter than the sun and just 0.12 times its mass, and the planet huddles nearby, at just 5 percent the distance between the sun and the Earth. (The star has a diameter just 1.4 times that of Jupiter.) Researchers think because of its close orbit the planet is likely tidally locked and in synchronous rotation, which means that it always presents the same face to its star as it orbits around (like Earth’s moon does). One half of the planet is always bathed in the sun’s radiation, and the other faces outward. “One side is always sunny, the other is gloomy and dark,” Guillem Anglada-Escudé, a researcher at Queen Mary University of London and lead author on the new paper, said during the briefing. Looking up at the sky from the right location on Proxima b, then, one might see two bright dots of the nearby binary system, Alpha Centauri — a pair that researchers think are part of the same system as Proxima Centauri, even though it’s relatively far away compared with the two stars’ closeness. Without an atmosphere, the planet’s surface could hover at around minus 40 degrees Fahrenheit (minus 40 degrees Celsius). But that’s no cause for alarm, the researchers said during the briefing — Earth itself would hover at around minus 4 F (minus 20 C) without an atmosphere. If this planet has an atmosphere, too, it could range from minus 22 to 86 F (minus 30 to 30 C) on its dark and light sides, making it warm enough to host liquid water on its surface. Whether it has that atmosphere and water, though, depends a lot on the planet’s history. “This is open for speculation, but chances are good — there are viable models and stories that lead to a viable, Earth-like planet today,” he added. Another thing to consider is the radiation beaming off the nearby star, researchers said — because Proxima Centauri is so close, strong enough X-ray and ultraviolet radiation would stand a chance of boiling off the water and stripping the planet’s atmosphere. While the current high-energy radiation — about 100 times that of modern-day Earth, the researchers estimated — isn’t enough to have that effect or to preclude life, it’s possible that earlier in the star’s lifetime it could have been violent enough to take a toll. “None of this does exclude the existence of an atmosphere or of water,” Reiners said. “It all depends on the formation of the system.” As for the modern-day radiation, “we don’t think it’s a showstopper here,” Anglada-Escudé said. 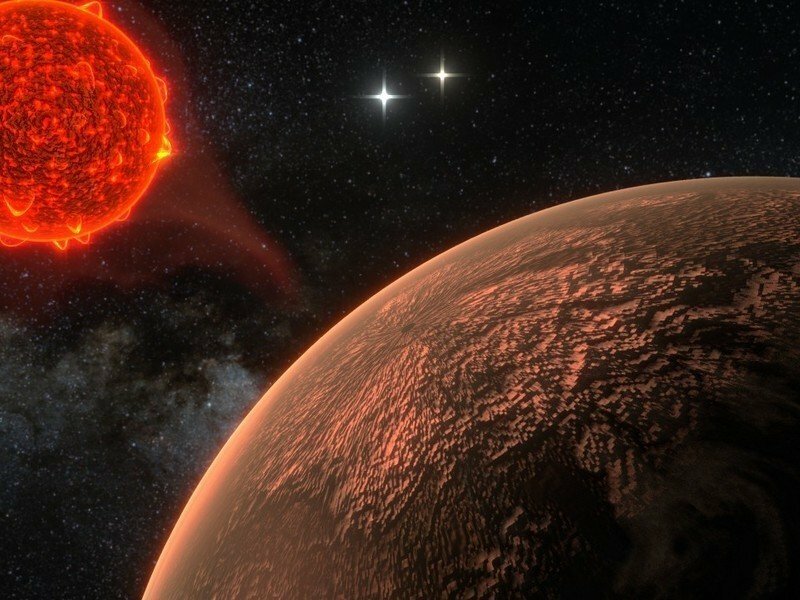 The researchers also mentioned other signals in the star’s wobbles whose source was unsure — it may just be the star itself, or it might indicate another planetary neighbor, or one large planet with an entourage of smaller ones around it, the researchers said in a second press conference. That planet, though, would be farther out, larger and well away from the zone where liquid water can exist. Further observations will help resolve whether or not it’s a stellar system of one — and more information about what the planet and its system are like are surely coming soon, the researchers said. “The good news is that it’s so close,” Reiners said. “This is not only nice for having it in our neighborhood, but this is also a dream for astronomers if we think about follow-up observations.” Source: What’s It Like On Our Neighbor, Proxima b? Could Spacecraft Make it to Proxima Centauri? Breakthrough Starshot, Russian billionaire Yuri Milner’s latest project, aims to use light sails to laser-boost tiny probes to 20% the speed of light. They’re supposed to report back from other stars. Am I the only one who cringes every time Captain Kirk orders “Warp speed!” aboard the U.S.S. Enterprise? As the spaceship accelerates to the speed of light (and beyond, because, hey, it’s fiction), I can’t help but think: what if they run into something? It wouldn’t take much. 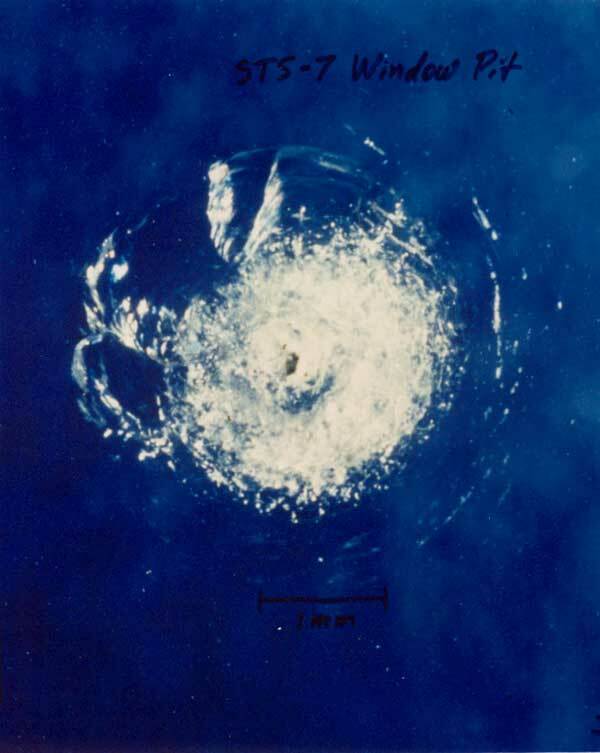 In 1983 a micrometeoroid collision cracked the window of the Space Shuttle Challenger, though the damage was non-critical. That was with the shuttle traveling at an orbital speed of only 18,000 mph, nine times the speed of an average rifle bullet — but only 0.0027% the speed of light. If we ever want to travel at truly relativistic speeds to reach the nearest stars, spacecraft will have to endure far more — and the planet discovered around Proxima Centauri makes the prospect of interstellar travel awfully tempting. The Breakthrough Starshot initiative intends to do just that. Last April, billionaire Yuri Milner announced he was putting $100 million on the table to fund scientists and engineers to test the feasibility of sending gram-scale spacecraft on a 20-year journey to the Alpha Centauri system at 20% the speed of light. In a paper posted August 18th to the online preprint server arXiv.org Hoang’s team explored what might happen to a tiny, gram-scale probe like that proposed by Breakthrough Starshot: a mini spaceship made of a computer chip that contains the all-important sensors (composed primarily of silica) and a reflective lightsail vital to accelerating the craft (composed of graphite). Because of the probe’s high speed, it essentially sees any lone atom or dust mote floating in space as a relativistic projectile. Dust is the main enemy. While interstellar gas is mostly hydrogen and helium, with a few other trace elements thrown into the mix, cosmic dust particles, while tiny and rare, are composed mostly of heavier atoms. 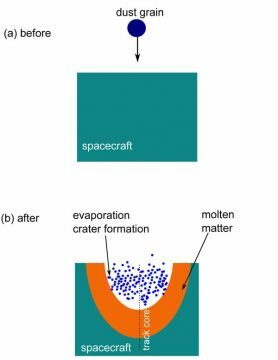 At relativistic speeds, every dust grain that gets in the way will both evaporate and melt material on the spacecraft, generating an impact crater. If the dust grain is any bigger than 15 microns (roughly the width of a human hair), the crater it makes will encompass a gram-scale spacecraft — in other words, a single “large” dust grain would destroy the whole probe! Fortunately, cosmic dust grains of this size are rare: the authors peg the chance of running into one of them at one in 1050 (that’s one in a trillion trillion trillion or so, or in other words, practically never). Still, impacts from smaller grains could be enough to damage sensors or other key components. Though dust can wreak havoc, interstellar gas shouldn’t be ignored, the team found. The few heavy atoms in the diffuse gas between stars can do their share of damage. They’re particularly dangerous to silica-based materials (not so much to the graphite-based lightsail), leaving tracks of damaged in their wake that gradually weaken its strength. The numbers are in line with lab experiments that have shot energetic particles at matter, though more data is still needed to test how high-speed dust molecules would interact a solid surface. If a probe hits a dust grain at relativistic speeds, the spot of impact heats up and evaporates (close to the dust grain) and melts (farther from the grain), creating a crater on the surface of the quartz or graphite material. So, how does one protect a spacecraft traveling at a significant fraction of lightspeed? Hoang and colleagues suggest two complementary approaches. The second approach is to shield the probe with some kind of protective covering, such as a graphite coating a few millimeters deep. The lightsail itself — which is really only necessary for acceleration — could provide additional shielding, the authors suggest, if it’s folded up in front of the sensor-laden chip once the probe is underway. So an interstellar flight to Proxima Centauri might well be feasible. And flying out of the solar system isn’t a problem because the Alpha Centauri system lies out of the ecliptic plane. The caveat, says coauthor Abraham Loeb (Harvard University), is that we know very little about how the level of dust rises near the star — we don’t even know how “edge-on” we’re seeing Proxima Centauri. “There is a risk that if its dust content is much larger than that of the solar system, it will damage the spacecraft,” Loeb explains. Loeb chairs Breakthrough Starshot’s advisory board, which just convened this week to organize the initiative’s first five to ten years. During this first phase, scientists and engineers will test the feasibility of travel to the nearest star system.